Mix equal amounts of Vienna crème and whipped topping together. Drain and towel dry fruit cocktail before folding into the prepared custard filling. Refrigerate. 1. Wash all fruits and thoroughly dry. 2. Thinly slice the kiwi. 3. Slice the strawberries in half and thinly slice. 2. Add 1-1/2″ to 2″ of the prepared custard on the cake layer and spread evenly. 3. Place the other half of the cake layer on the custard. 4. Spread a thin layer of the Vienna crème on top of cake. 5. Arrange the fresh fruit on top of the Vienna crème as desired. (Leave space on the edge of the cake so you can pipe on a border of whipped topping. 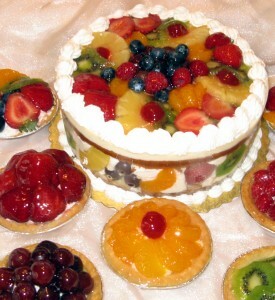 Place slices of fruit around the side of the exposed custard. 6. Warm up the Harmony Briant and thoroughly cover all the fruit. 7. Wrap the acetate cake collar around the cake and use tape to hold it in place. 8. Pipe on a whipped topping border on the top and bottom layer of the cake.